Members of Stephen F. Austin State University's professional business student organization Phi Beta Lambda won nine awards and made history by winning the first Who's Who award for the university at the recent Texas State Leadership Conference. Pictured, from left, are members Mark McLean, John Cohen, Sandra Ramos, Mia Branch and Chris Weir. NACOGDOCHES, Texas - Members of Stephen F. Austin State University's professional business student organization Phi Beta Lambda made history and won nine awards at the recent Texas State Leadership Conference. John Cohen, organization president and senior accounting major from Mesquite, was named Who's Who for PBL and became the first SFA student to receive this honor. "I've been a member of this amazing organization since my freshman year, and I've been in leadership roles from the get-go," Cohen said. "Having a physical object to memorialize my accomplishments, the friends I've made and the mentors I've learned from is something I'll always treasure." During the conference, students from the Rusche College of Business competed against universities from all over Texas in events that tested their business knowledge and skills. These competitive events included objective tests and/or performance-based activities. SFA students brought home wins in various categories. First-place winners include Christopher Weir in contemporary sports issues; Mia Branch in desktop publishing; and Mark McLean in macroeconomics, who also placed second in financial concepts. Second-place winners include Miguel Leeroy Silva in microeconomics and Bertha Bailey in retail management. Shaye Smith placed second in job interview and third in public speaking. Aaron Lee placed third in sports management and marketing. "I'm proud of all the students for their hard work and dedication. They are great students, and these accomplishments not only reflect highly upon them, but also on the college and university," said Manuel Guerrero, lecturer in the Department of Business Communication and Legal Studies and PBL advisor. Students attended workshops to help them better understand business and to network with industry professionals. 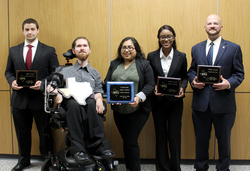 This summer SFA students who placed either first or second at the state conference will compete in the national conference in Baltimore, Maryland. PBL is a nonprofit educational association for students preparing for careers in business, entrepreneurial or business-related fields. It is open to all business majors.